So glad Yuberactive had another shade of this to try as I simply loved the Green With Envy one. This shade is just mesmerizing.. 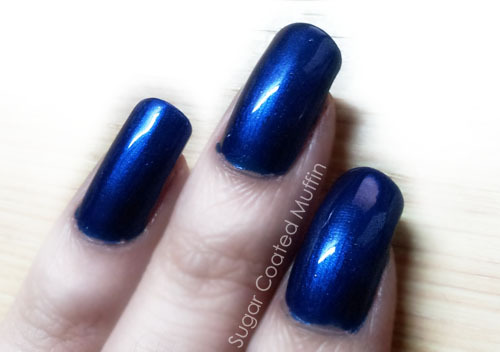 It's a lovely deep blue with really fine shimmer. The polish itself is quite watery and goes on really smoothly. Because it's so watery though, it may get messy. The brush is not my favourite but works well with the consistency of the polish. Spot a fingerprint on my pointer finger? No idea how it got there. Considering it's so watery, I would have expected it to dry a tad bit faster.. 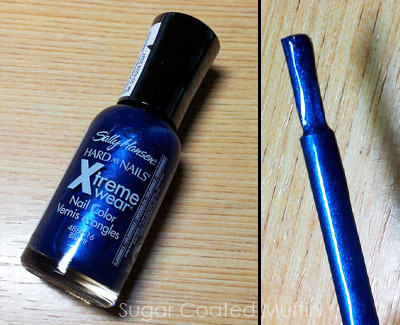 Product says : With Xtreme strength and shine, Sally Hansen Hard as Nails Xtreme Wear has the bio-active glass formula that bonds to nail proteins, hence providing ultra-durable protection and shine by forming calcium-rich mineral layer on the nails. Has an easy grip, easy glide brush design to give complete control. My conclusion : Love the colour.. Would I recommend it? Yes! Definitely..